Imagine my surprise when, on February 15th, I received notification from @MariaPilarClark that I had won a contest I entered on the Cosmotot blog at ChicagoParent.com! What a happy email that was! The contest was simple to enter, and I did so not even dreaming that I would win, but I did! And the best part about the winning? The prize pack was really cool! Take a look at the prizes that were sent to me from the Disney Store! A match set of Valentine’s Mugs! Perfect for Hot Chocolate! Minnie’s Cup has a big heart also! In addition to the Valentine’s mugs, we also got a really cool set of Mickey and Minnie Plush dolls! Take a look at these! And Minnie holding Mickey’s Heart! What the plush doesn’t show is that the heart opens up, and a “To/From” Valentine Card is inserted inside! In addition to these shots, take a look at some of the details on the Minnie Plush! The plush dolls are called “Pie-Eyed” because of the way the eyes are. To top it off, a Disney Valentine’s Day Reusable Tote Bag! Maria Pilar Clark — for announcing the contest on her Cosmotot blog and hosting it with ChicagoParent.com! The Disney Store and the @DisneyStorePrez — Thanks for giving away such great items for contests all across the Internet! Thanks everyone for reading! Have a Magical Day! 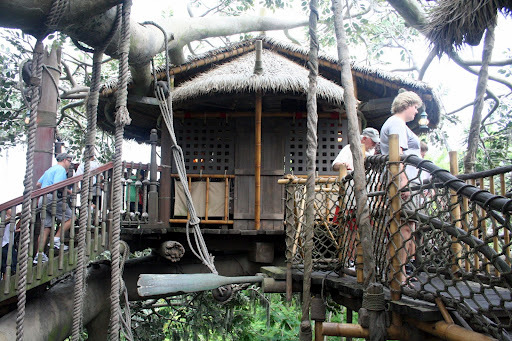 Have you seen my post over on Chip & Company about Swiss Family Treehouse? If not, why don’t you head on over and take a look at it? If you have seen it, tell me what you think in the comments below! Is it an eyesore or a Classic Disney attraction to you? Come back later today for a special post about a Disney Giveaway that I won recently! See you back here at 3PM!